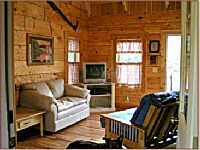 The Cabins at Trail's End are situated on 17 acres of new woods running right along the Hocking River. All the cabins on the property overlook a crystal clear, well stocked private catch and release fishing pond for which no license is required. The mowed walking trails take guests right to the river. The property is within a reasonable distance of all the parks and attractions in the Hocking Hills and is closest to Cantwell Cliffs, The Hocking Hills Market in Rockbridge, Ohio, and the Hocking Hills Adventures Kayak and Canoe Livery. The lodge and the cabins are equipped with gas grills, hot tubs, fully equipped kitchens, DirectTV, DVD, fire rings with wood provided, and all linens and towels. There is a bedding and towel credit for people who choose to bring their own as well. All of our cabins also welcome pets. Trail's End Lodge has a big back porch, a bar that is great for serving and entertaining, a large dining table, pool table, huge stone fireplace, foosball table, table games, large 50 inch flat screen television, and volleyball court out front. There are three bedrooms see layout and two futon couches in the great room. It is a wonderful place for families to gather and spend time together. 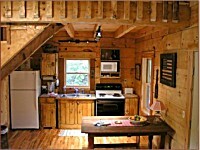 Buckeye Loft and Flo Mines cabins are hand hewn log cabins with a fully stocked kitchen and cozy living room on the bottom floor and a queen bed in the loft area. they offer privacy for relaxation and romance. Small families fit nicely in these cabins as well. Buckeye Loft is decorated with all things Ohio and Flo Mines is decorated with an Americana theme. 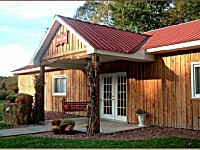 These cabins have a wonderful Hocking Hills ambiance that thrills our visitors. We look forward to welcoming you to Trail's End in the captivating Hocking Hills.